Draperies and soft furnishing can add new life to your rooms! March is the Month of Rebirth! What I mean by rebirth is to give new life to your rooms! Even if you are satisfied with the look of your spaces, it does not hurt to try something new and exciting! Some ideas for different changes can be an add-on, a partial change, or a total make over! An add-on can be a new accessory, for example changing the hardware of a treatment, adding a banner, swag, or tassels. 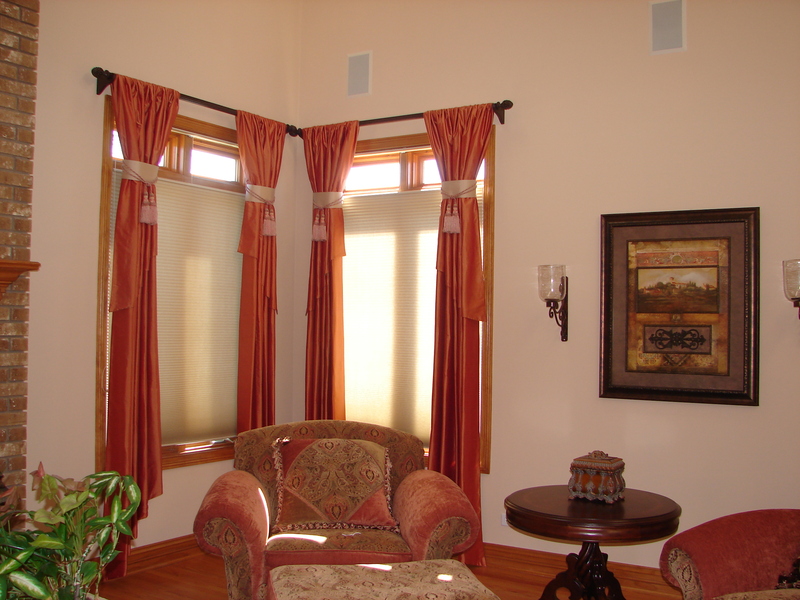 A partial change could be having new shades and replacing the old, dated ones with new fresh ones while keeping the draperies or valances. Or perhaps you are due for a total room makeover! Whatever the case might be, it is always a good idea to bring in some changes to your space to add joy, energy, optimism, and happiness into your life. Think reupholster: Give an old piece of furniture a totally new look by not only changing the fabric, but also changing the shape of the arm and the back. You can add a skirt, or add nails, buttons, cords or tassels! 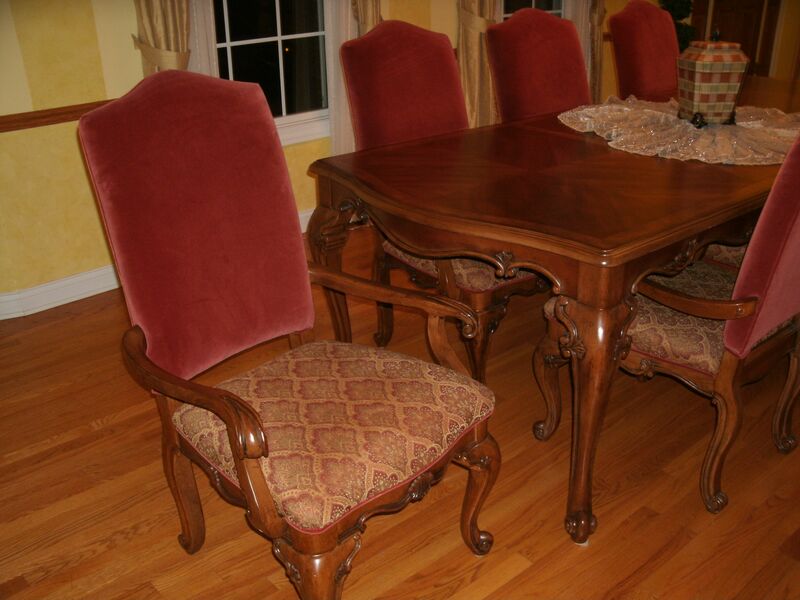 The picture below is of a set of dining chairs with new upholstery. We gave it a smart, new look by having tapestry seats and velvet backs. The old chairs were boring with off-white, ordinary fabric. Think new updated finish: Give an old table or chair a new updated look with faux finish. See the video below for a table that was oak to match the chairs, but now has a totally updated look with a new finish. Think slip covers: Slip covers are in fashion now and you can have a fun slip cover for one or more pieces of furniture to create a new ambiance in a room. Think of new throw pillows: A group of new custom pillows on your sofa, bed or chase can bring new colors, textures and add patterns to any room. Think reversible: You can try drapery panels that have two faces and you can reverse them as needed. You can have a valance with two faces and use Velcro to attach it to a board, and when you are tired of one face, rip it off and reveres it. The throw panels below have a burned brick color and are lined with a champagne off-white color. 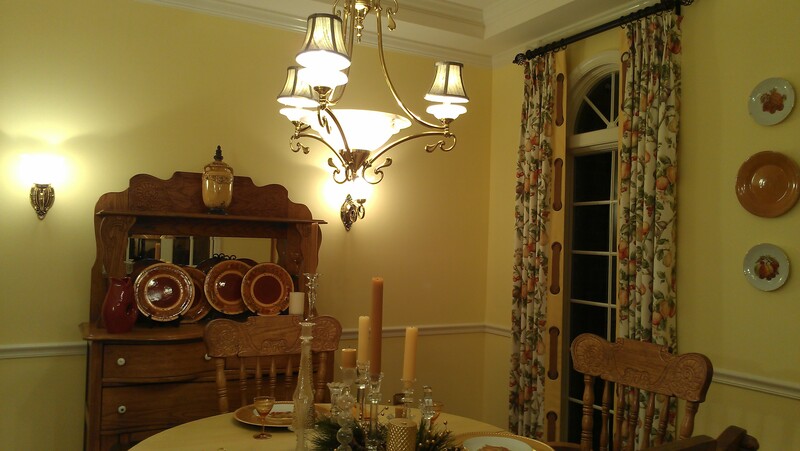 Our goal was to use the brick color for now and if the furniture changes in the future, the neutral color will still work, or if the house is put on the market for sale, it will help the prospective buyers to visualize themselves using the same draperies for a while without going through new purchases right away. Think attachable: Have you thought of adding banners, flags, swags, bows, jabots and any other piece you can think off? I have designed draperies with changeable banners to go with different rugs, to change with the seasons, and my client loved it! Take a look at the pictures below and tell me how many variations you can think of when you look at the treatment. How many can you make for picture A and how many for picture B? I have 5 Starbucks gift cards with $5.00 on each and I am sending it to the first 5 people who respond with the right answers! Have a cup of coffee on me! Architella Shades by Hunter Douglas! Architella shades are one of the most popular shades from Hunter Douglas. It has gained it’s popularity because of it’s energy saving design as well as its applicability to any decor. Here is a video to help you understand how Architella will help you save energy and money! Call us for free design consultation (630)420-0800. The room of the month! 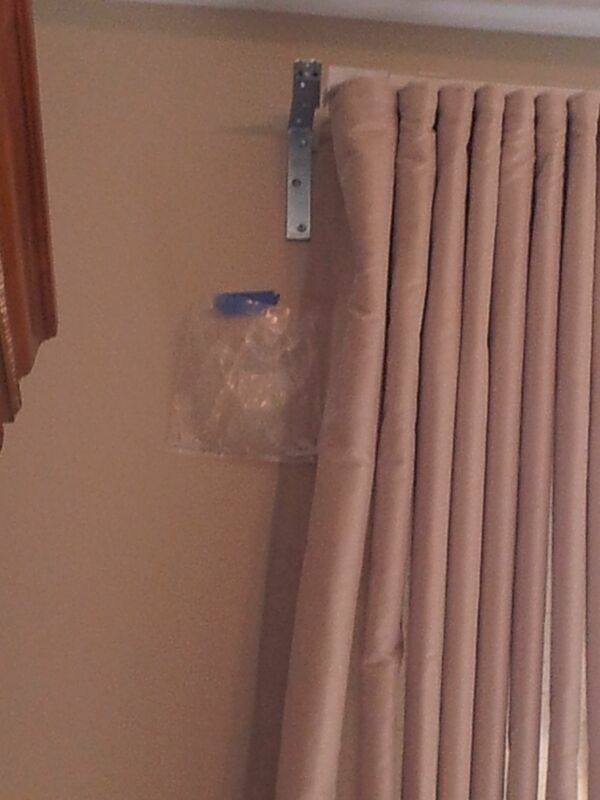 An Installation took place last week in Burr Ridge IL. The room was medium sized and well lit, however the furniture was a little over sized and too many pieces were used. That made the room seem even smaller. 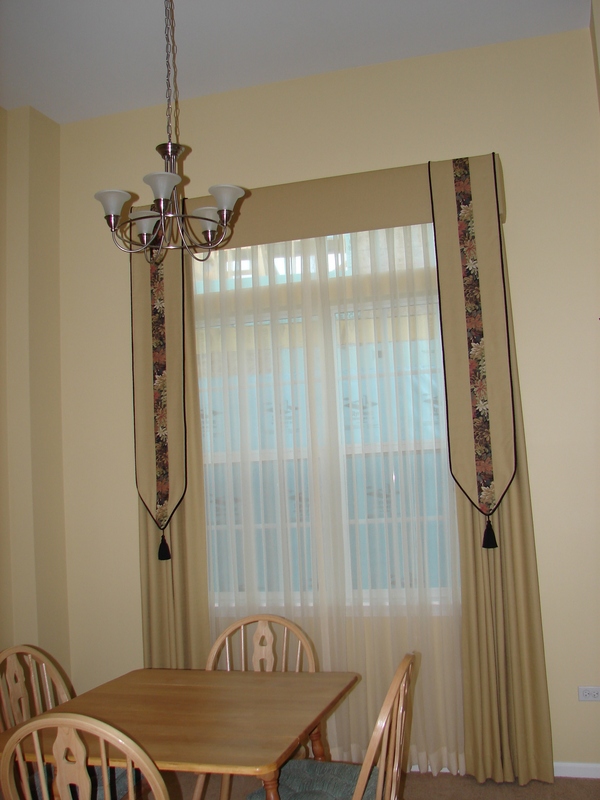 Here is how the windows were dressed to help the room appear bigger, and more spacious: the walls were painted in a warm, light taupe, and the treatment was kept simple. We raised the panels as far as possible, keeping the proportions in mind, and the color of the drapery fabric was the same color as the walls, lowering the contrast. Both of these things delude the eyes into thinking the room is larger than it is. The client expressed interest in ripple fold draperies in place of sheers and blinds for privacy, and she wanted to create the feel of a five star hotel. I believe, she got it!